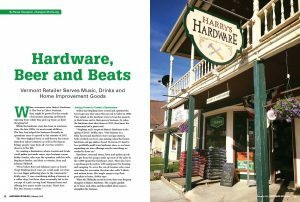 When customers enter Harry’s Hardware & The Den in Cabot, Vermont, they might be greeted by the sounds of musicians jamming and friends enjoying beers while they pick up items on their shopping list. 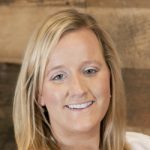 While the hardware store has been in existence since the late 1800s, its most recent addition, The Den, has helped the business diversify its operations since it opened in the summer of 2017. The New England town is well-known for tourist attraction Cabot Creamery as well as the famous foliage people come from all over the world to observe in the fall. So creating a destination where tourists and locals could gather just made sense, says business owner Bobby Searles, who runs the operation with his wife, Stephany Searles, and their co-owners, Rory and Johanna Thibault. 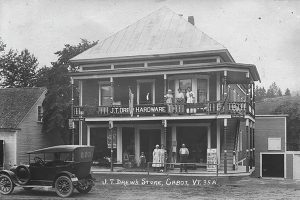 Harry’s Hardware & The Den in Cabot, Vermont, has been in business since the 1800s as a hardware store. 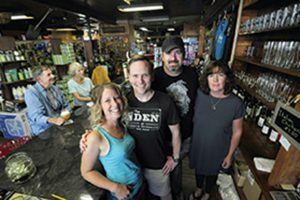 Recently, the operation expanded its offerings with The Den, a space inside the store where customers can enjoy Vermont beers and listen to live music. Bobby and Stephany have owned and operated the town’s grocery store since they moved to Cabot in 2006. They relied on the hardware store in town for projects in their home and in their grocery business. So when the hardware store shut down in 2012, they knew the community had a great need. Hardware, seasonal items, lawn and garden goods and gas from the pumps make up most of the sales at the 3,000-square-foot hardware store. They also have a sporting goods section with equipment for hunting and camping. To serve the out-of-towners who come searching for souvenirs, the store also sells T-shirts and artisan items, like maple syrup to top their pancakes at home, Bobby says. 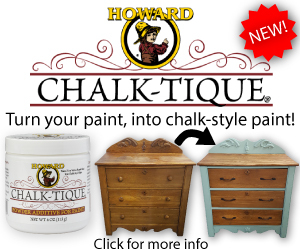 When the Thibaults moved to town, they were frequent shoppers at Harry’s Hardware. The couples quickly go to know each other, and they talked about ways to strengthen the business. Eventually they decided to become business partners. Rory and Johanna bought their share of the business in April 2017. 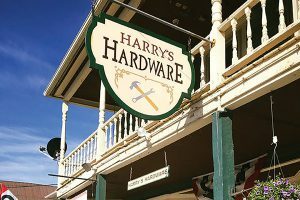 Both locals and visitors of Cabot, Vermont, enjoy going to Harry’s Hardware & The Den to shop and enjoy drinks while listening to music. In the summer of 2017, the owners launched The Den, which is located inside the store near the checkout counter. It features a 12-foot granite bar top and is built of hardwood, evoking a traditional Vermont style. 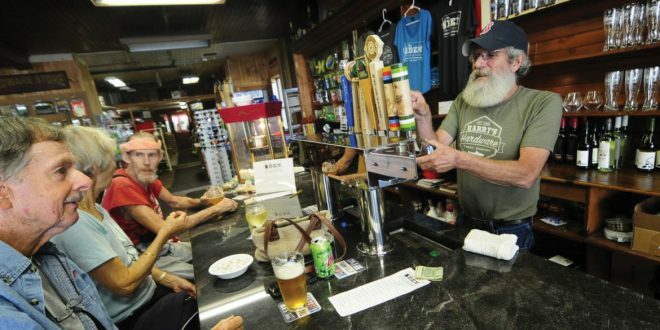 The Den’s drink lineup includes Vermont craft beers on tap, as well as wine, and other nonalcoholic beverages, including locally made kombucha on tap. 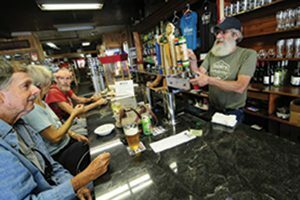 The owners decided to exclusively sell Vermont craft beer in an effort to support other local businesses. 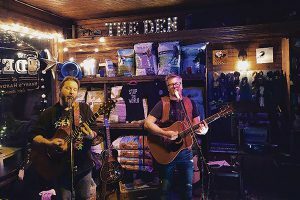 In addition to becoming a fun place for people to grab drinks and catch up, music became an additional offering at The Den that has continued to grow since the first musicians stepped on stage. Additionally, on Sundays, the store has anywhere from two to 10 musicians that will come and jam together from noon until 2 p.m., which helps draw in customers who come enjoy the music and a beer while the musicians practice and improvise. Throughout the year, the business hosts a few large events, bringing live music, local artisans and food trucks to the community. 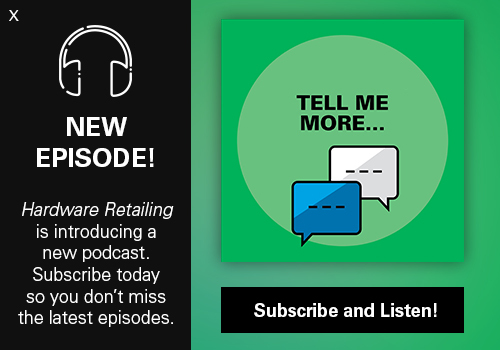 For retailers who have considered other ways to diversify their business, whether adding a new niche or opening a bar, Bobby says it’s important to figure out how to keep customers coming back for more.